Sutton Pond Condos North Andover MA is located on Main Street close to downtown North Andover. There are 188 Townhouse and Garden style condos in this community. The 3 wings of the building are named Bradstreet, Stevens, and Kittridge. The condo fee ranges from $230 to $403 per month and it covers water, sewer, master insurance, elevator, exterior maintenance, road maintenance, landscaping, snow removal, exercise room, clubroom, extra storage, and refuse removal. 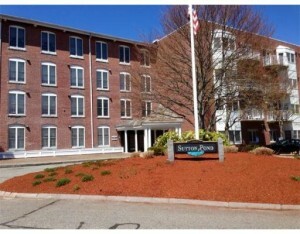 Sutton Pond Condos consist of 3 bedrooms, 1-2 baths, 1-2 bedrooms, 885 – 1,248 square feet. Features include an Views of Osgood Pond, balconies, central a/c, open floor plans, club room with kitchen, exercise room.